They are delicious, bite-sized and oh so cute! 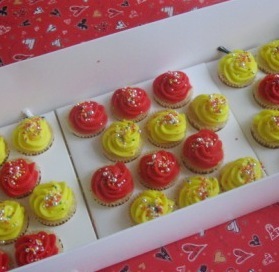 Our Minis are made with Vanilla cake and festively with vanilla buttercream frosting, tinted to celebrate National Day. Each mini is finished with colorful sprinkles. Our minis are approximately one-quarter the size of our regular cupcakes and measure approximately 3.5 cm in diameter and 3 cm in height.